In HighScope, we believe that education and the building of positive character starts at an early age. Children as young as toddlers start their learning about the world and how to relate with other people. They learn the skills in social and emotional development, by interacting with other children, interacting with objects and interacting with events, guided by teachers who provide continuous support and training in their daily interactions with children. At HighScope Indonesia’s Early Childhood Educational Program, adults when facilitating children’s learning are guided by 58 Key Experiences that support children’s development in the physical, social, emotional and cognitive areas. Children are involved in direct, hands-on experiences with people, objects, ideas, and events. These active learning experiences will help children construct their knowledge, i.e. learn concepts, form ideas, and create their own symbols and abstractions. As facilitators, who will also observe and participate in children’s activities, teachers are guided by key experiences that all children need to have as part of their intellectual, physical, social and emotional development. The classroom is arranged in five or more interest areas. The areas are labeled with simple names that make sense to children, such as “Block Area”, “House Area”, and are clearly defined. The materials are varied, developmentally appropriate, plentiful, open-ended, and related to community/culture. The materials are organized in a way that allows children to find, use them, and return them when they are finished using them. This arrangement supports children in finding and using materials to explore, invent, and learn about their world. Besides the above plan-do-review sequence, the organization of the day also allows children to meet in small groups to engage in adult-initiated activities based on children's interests, needs, and developmental levels and to engage in whole-group activities that stress social interactions, music, and physical movement. 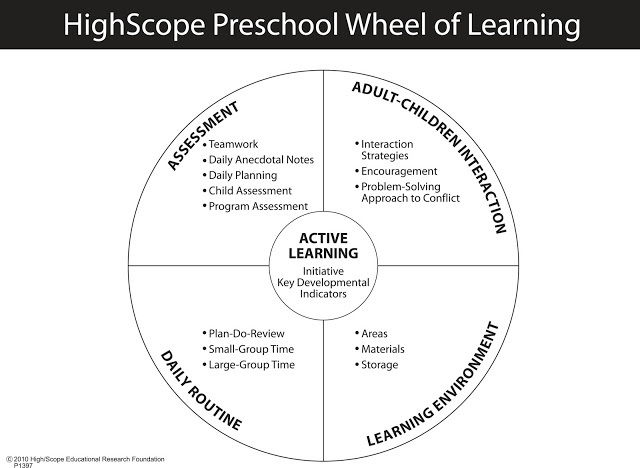 Thus, Highscope teachers regularly record notes on children’s behaviors, experiences, and interests. They use these notes to assess each child’s development and to plan activities that will facilitate their growth and development. The notes are also used in parent conferences to help parents better understand their children’s development. Sign up here with your email address to receive updates from Sekolah HighScope Bali in your Inbox. 2 Responses to "EARLY CHILDHOOD EDUCATIONAL PROGRAMS"
Halo, saya ada beberapa pertanyaan 1.pengajarannya memakai bahasa apa yg utama? 2. Bisa dimulai untuk anak umur berapa? 3. 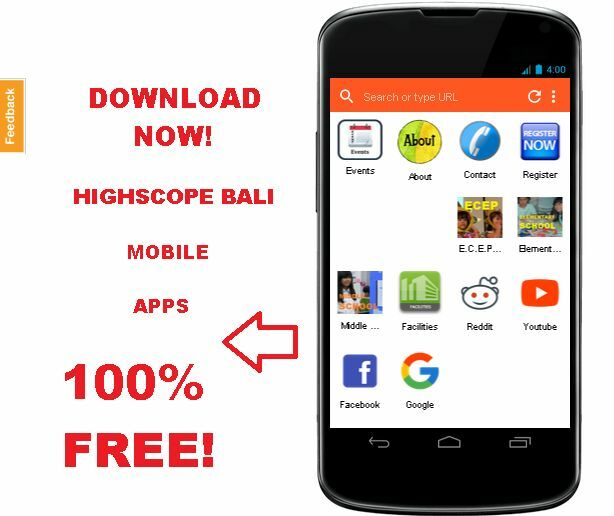 Apakah ada free trialnya?